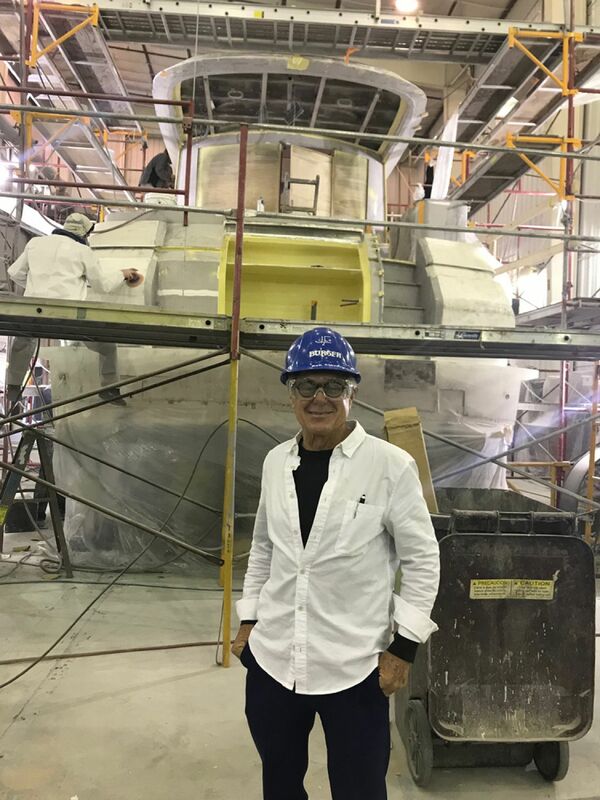 Luke Brown Yachts President, Andrew Cilla reports on his visit to the Burger Shipyard in April 2018. At the Miami Boat Show I ran into my old friend Ron Cleveringa, Vice President of Burger Yachts in Manitowoc, Wisconsin. Ron updated me on the two 48’ Vripack design cruisers that they currently have in build. I was most intrigued and decided to make a visit to the shipyard to learn more about their new project. This may be the most unique cruiser I am aware of, currently in build. Unique in that they are built in aluminum, by a shipyard that made its’ name launching some of the largest motor yachts in North America. The 48 Cruiser features a rather Avant Garde style and incorporated a newly patented hull design. Referred to as the slide hull, this easily driven hull form can operate in a semi-displacement mode at speeds greater than 30 knots. Recent launches, utilizing this hull design, demonstrated a higher degree of comfort, while proving to be approximately 15% more efficient. Hull #1 is sold and will be delivered to her owner in June. Hull #2 is available and can be delivered in approximately 5 months. The accommodations are huge for a vessel in this size range. The master and guest staterooms will provide the same level of comfort as those of a typical motor yacht in the 60’ range. Building in aluminum offers a myriad of possibilities. The new 48 Cruiser project maybe perfect for those that would prefer the opportunity to have a custom-built yacht so that they can create a vessel specific to their requirements. I could not help myself… my vivid imagination brought me to my adaptation of her hull form. A pilothouse configuration, with a more traditional look, replacing my Nordic Tug 44. Luke Brown Yachts, very possibly has sold more Burger Motor Yachts, on the brokerage market, than any other firm. We have earned the opportunity to represent our clients who may choose to build with Burger. We welcome your inquiry.